I am now up in London setting up the show and will look forward to meeting everyone at this new event (for us) over the next few days. To Latest Stock various - it is always nice to present new range items and here we have a couple of sundial designs in the form of the (umm what am I going to call these then) Equinox and most originally, the Large Equinox carved stone sundial pedestals - all to support our ever popular armillary and slightly forgotten but rather well made Thomas Wright sundial plates. To the old and even by my standards an eclectic mix me thinks; best stay with the sundials to start with then - I have something Swedish in the form of this armillary with seahorse, designed in the 1950s and stamped 'Sune Rooth' (surely it must be Scandinavian joke? 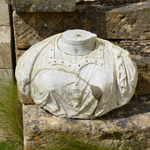 ), it is mounted on a carved Bath Stone column pedestal. Winding back some 250 years to a marvellous horological oddity in the form of this 18th century polyhedral sundial, probably Scottish and now with replacement Gnomons this is a rare bird that one comes across only once or twice. Links to Scotland.. well we have a rather nice Terracotta Diana de Gabie attributed to the best Scottish maker of 'fire clay' that being Garnkirk of Glasgow - salt glazed (literally salt put in the kiln) giving it its distinctive colour and texture and with the smallest of light brown plume to one corner of the base, this statue, though unsigned, is in my opinion a very good example of the Garnkirk works. Though Gavin Hamilton did not dig up, unlike most of the best antiquities in museums today, including Diana at Gabii near Rome, this 17th century bust would not have been an uncommon sight to him, as any Grand Tourist would have sought out such an item to furnish their collections great and greater. Another Grand Tour example ( though a touch later!) is here in the form of this marvellous copy of a hollowed out Roman column capitol, used as a well head - lumps, bumps, lead secured rusty iron bars and all - people really don't believe me when I say it's new but I know the man who made it so there it is. From Rome via Scotland we arrive in Yorkshire, which is where I purchased and have now fully restored these wonderful gates from The Nawton Tower Estate. We have three sets of the single gates with pillars and one pair of double gates, all ready to go - one pair will be on display at GROW should you wish to view in person. It is a little tenuous I know but this unusual Folk Art sign with Pheasant takes me to China, a place where it (the Pheasant that is) and the Temple Guardians both originated 2000 years ago (the Guardians that is) - these are though in fact, to the best of my knowledge, Japanese Dogs of Foo, Fu Dogs - trust me it goes on.. The tradition migrating to Korea and Japan from an early age and are in fact not dogs but stylized lions (no lion was ever seen in person in China 2000 years ago) and now passed down to us in the form of what can be only described as a pair of rather fierce Shi Tzu's! Wonderfully carved in what I must say can only be the hardest stone next to Porphyry that I have ever known, they would grace any Japanese garden, both established or as yet to be imagined. I have to end and to that I hear hurrah! But with the Solstice fast approaching it is to this little lead figure of Summer I turn to wish you well and to enjoy the sunshine wherever you may be. Apologies to clients who are trying to contact us, we are experiencing a few technical problems with email, we hope this will be resolved today, however please do telephone with any immediate enquiries.